The Chrome Extension for Any.do makes adding tasks more convenient than ever! 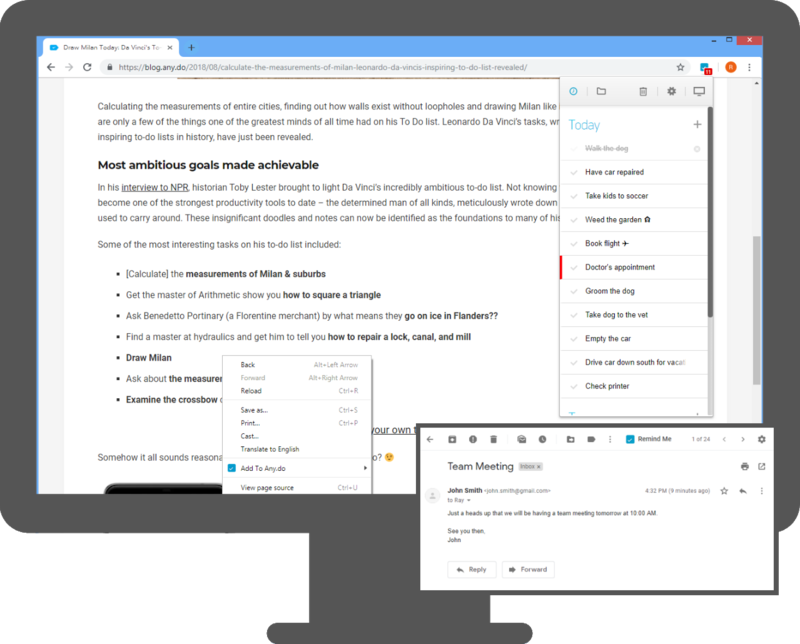 You can quickly create tasks out of emails, turn websites into tasks with just a right click, and create tasks from the corner of your browser. You can also view all of your tasks organized by list or by time, complete tasks, and delete tasks. To install the Extension: Go to this link and press “Add to Chrome” on the top left of your screen. To delete a task: Press the grey “x” icon to the right of a task. To clear all completed tasks, press at the top of the extension. To minimize a category: Press the category name. Minimized categories will display the number of tasks within them. To switch between list/time view: Press to switch to time view, and press to switch to list view. To add a task from an email: Press the button that appears at the top of your gmail inbox.